The story basically goes something like this. 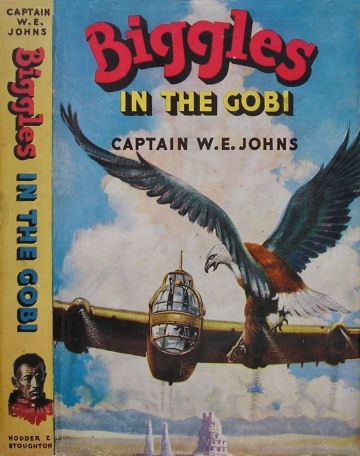 Biggles is asked by Air Commodore Raymond to travel to the middle of Asia to rescue some missionaries from the evil Communist China. Biggles takes Algy, Ginger and Bertie with him in his unmarked Halifax bomber. Also travelling with the tram is a Chinese man by the name of Feng-tao (who speaks virtually no English). 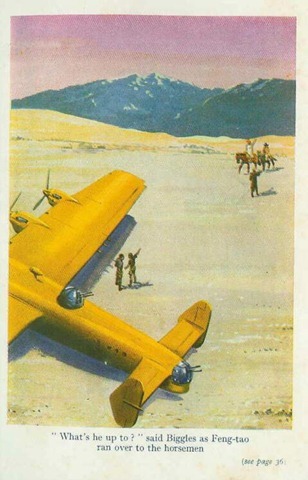 Biggles flies the Halifax from Pakistan to the Gobi desert. The missionaries are supposedly hidden in a cave but there is nowhere suitable to land within miles (well duh, it is the middle of the desert and as I recall, Halifax bombers were not really designed for off roading). Algy, Ginger and Feng-tao parachute down whilst Biggles flies back to Pakistan. The plan is for Algy and Ginger to build a runway. However, they find that the missionaries have been attacked and that only four out of eleven remain. One had already died, two were killed in the raid and four have been captured and taken prisoner. Facing constant threat from Chinese soldiers, lead by the evil Ma Chang – known as ‘the tiger’, Algy and Ginger have to hold out. Ginger organises a rescue attempt using the fierce Kirghiz tribesmen and manages to free the four captured missionaries. Biggles and Bertie have had problems of their own, however, having hit an eagle with the Halifax (see the illustration below – the dust jacket). This accident with the bird has forced them to land to repair the plane (and this is the plane they expected to land in rough desert, grounded by an eagle). Biggles is able to return, after shooting down a MiG jet (right – Halifax bomber versus MiG jet and MiG loses – yep, can see that). When he arrives back the final battle is in full swing at the caves. He is able to rescue everybody, get them away and save the day. Yay! OK, I was young at the time and I enjoyed Biggles. Tempted to look for some of the tales again, if only for period feel.